What’s Cooking with Kitchen Ranges? Kitchen ranges are considered the focal point of the kitchen – after all, most of our nourishment through cooked food originates from here. It is therefore crucial to select the one that serves you efficiently, safely and has all the features you would use. Thanks to the surge in industrial cooking appliances, many manufacturers are now offering a variety of kitchen ranges for domestic use and it is mind boggling to find almost limitless options in features, in addition to choose in colours and size. It is obvious that it is worthwhile to look at what is available before you make the final decision. Some people prefer to go in for a separate oven and cook tops that fit flush into your countertop. Next, comes the decision between fuels – electric or gas? It used to be believed that gas was good for cook tops and electric for ovens. But with recent developments in design and technology, either of these fuels can be equally good choices. Depending on which part of the country you live in, you would go for the fuel that is more economical. 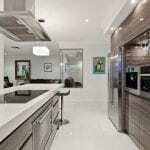 Kitchen ranges can be either gas, electric, or a gas-electric combination. Electric kitchen ranges are popular with most people since they are economical and electricity as a fuel is available almost everywhere. 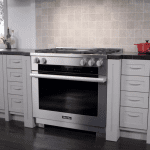 Electric ranges can be of two types – the ones with coil burners and smooth top type. With the coil burner, the coil is located just above the range top. It is considered easy to repair or replace when required. You can use a variety of cookware on these ranges. On the down side, because the coil is exposed, food spills can be messy to clean. Of course, there are accessories like drip pans that take the worst of it and are easy to clean. If you choose a coil burner model you want to check out how easily accessible the drip pan is, in addition to how simple it is to clean. With smooth top ranges, you can see a sheet of ceramic glass beneath which the radiant coils produce the heat for cooking food evenly. These cost more than the coil burner models. However, you would need to use flat-bottomed cookware. A big advantage with gas cooking ranges is the ability to regulate heat. When you switch the burner off, it cools quite quickly. Gas ranges can come with electric ignitions that let you switch on the burner instantly. You get gas ranges with special burners, which are flexible, letting you handle some quick searing, boiling or simmering. Gas ranges tend to cost more than electric kitchen ranges. If you want to install a gas range, you would need to arrange gas supply that could be LPG or natural gas and electrical circuit for operating the extra features. Gas ranges are more expensive to install than electric models. Gas-Electric combinations can bring you the benefits of both gas and electric ranges and naturally, cost more. Considering that cooking ranges come loaded with features aimed at fast temperatures, personalized cooking settings, storage for hot and cold food and kitchen safety, look at some of the features sported by the latest models in the market. Your range comes with programmable timing options so that you can pre-set your oven, starting or stopping the process from wherever you are! With this control in your hands, you can plan your meals. With the refrigerated cooking ranges, you can sequence the oven to cool, then bake and keep it warm. The displays are all electronic touch pads that are easy to read. You can get models with safety features, which let you, control who can access your oven. You can get ranges that accommodate a wide variety of cookware including turkey roasters and very big baking sheets in the oven. Some of the electric ranges in the market come with convection ovens that can cook almost 30% quicker than the regular ovens. While the trend is to go for a range that has the maximum features, it is important to choose the ones you are likely to use the most. *Freestanding range Probably the most popular choice, freestanding ranges are considered economical. These usually come with a cook top and an oven. Some can also come with a microwave or hood, a clock, timer and controls. *Slide in range If you prefer an installation where the range is accommodated between cabinets, slide in ranges are for you. You would need to make sure that the wall behind the range is heat and moisture resistant. *Drop in range These ranges are installed in a cut-out inside the cabinet, resting on the base of the cabinet. Choosing the ideal kitchen range for your home can seem tough, so it is a good idea to browse around to read customer reviews of the various models available. Each model comes with feature sets that suit different requirements. For example, electric ranges suit some, while gas is more advantageous to others. While selecting electric ranges, it is preferable to go in for dual burners where you can use the appropriate sized flame depending on the size of your cookware, making them more energy efficient. Ranges with self-cleaning ovens are better as the energy usage is lower while cooking. The most popular brands in the kitchen range market are Frigidaire, Whirlpool, Sears, Roebuck and Co., Bosch, Aga Ranges, Electrolux, Amana, Dacor, Jenn-Air, Kitchen Aid, GE Appliances, Kenmore, Maytag, Viking, etc. All these brands offer a wide range of models to choose from.